This entry was posted in photos, quotes, spirit, travel and tagged photography, photos, skywatch friday, sunsets, travel by Lilli Day aka bookbabie. Bookmark the permalink. I live on the other side of the “Peaks.” What a beautiful shot. Thanks. 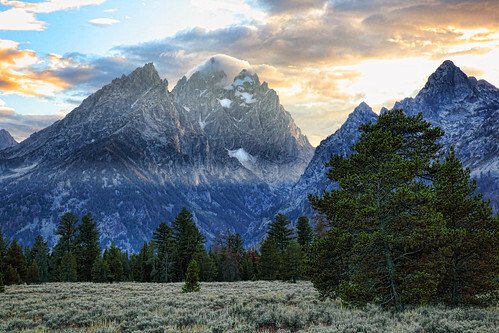 I LOVE the Tetons…LOVE. THEM. It looks like a painting. You are one talented lady. I love the quote by Helen Keller. It doesn’t hold a candle to yours! Unreal. I have to visit there someday. Beautiful Lilli… The Tetons are so gorgeous, but that picture with the sun’s rays coming through is marvelous. That’s a stunning photograph! Wow! What a awesome shot and looks almost like a painting! And very well could make an excellent painting. Wow! What a gorgeous image!!! Lovely and breathtaking! It is such a gorgeous view. Really breathtaking. Wow, am I ever glad I scrolled down! This photo is awesome. It is breathtaking! No wonder these are the most photographed mountains in the USA, if not the world! How I would love to be there! Utterly sublime! The textural quality and color gradations are marvelous.